Photograph This! : Strobes tests: Alien Bees against Elinchrom. Lumopro against Canon 580x II. Strobes tests: Alien Bees against Elinchrom. Lumopro against Canon 580x II. Guide Number = aperture x distance = constant. So if we measured f4 at 10 feet, the guide number GN is 40, which means that at 5 feet we will achieve the same exposure at f8 (closer, brighter, and so we can use a narrower aperture). The higher the GN, the more powerful the flash. This of course at the same ISO. So here are the numbers, I used ISO100 in all cases. Packs and flashes were all at full power. Btw, I have found another test here on Flickr. Results are similar. 1) more expensive flashes have more power and the area where they are able to light uniformly is *much* larger (and rounder!) than with the cheaper speedlites (see the image). But greater power comes with a price (and greater responsibilities, but that is another story). 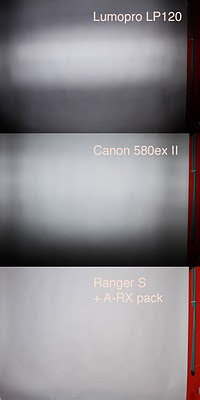 2) The Canon 580x II is good! More powerful than the LumoPro and the QFlash, but *only* if you use the zoom feature. Read the manual..or pay $300 extra bucks compared to the LumoPro, which is a lot easier to use (see and extended review)...mmm. 3) The Canon+ the Coco Ring flash performs well, but the output is not that great, unless you are in studio. The zoom factor makes no difference with the Coco attached. 4) The Speedlites are a tad cooler than the Elinchroms. 5) The Ranger pack has two outputs: A and B. A is 1+2/3 stops brighter.